I’m not sure if I should write a post for a race in which I was nearly last, but felt the start of a new season should be marked! My husband Dave had made a note of the date when entries open for this classic 23-mile fell race as we’d missed it last year and there are ‘only’ 900 or so places. We travelled upto Malham Youth Hostel the night before and arrived at Registration in Horton-in-Ribblesdale with plenty of time. Dave was hoping his knee would hold up after a bad fall 7 weeks ago so we’d planned to set off together – but then he failed to find me in the Start pen. The Three Peaks are Pen-Y-Ghent, Whernside and Ingleborough and it’s a classic walking route that takes about 11 hours. 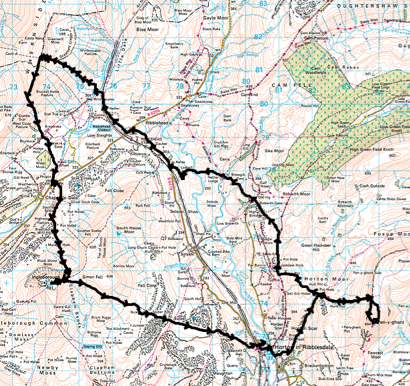 Running, the first split is from Horton to Pen-Y-Ghent summit (694m), a distance of 5.5km. The event has an excellent website with last year’s results and split times. We’d chosen a 2012 finisher who ran 4 hours 40 mins and used her splits – and I was relieved to find I was on course, taking 47 mins! Mind you, the pace was quite brutal so I was among the first to start walking!! One of the reasons we used previous split times is that there are 2 cut-off points round the course, and if you don’t get there within a certain time you’ll not be allowed to continue. We knew the cut-offs would be quite tight – the first is at the Ribblehead Viaduct 18km into the race at 2 hrs 10 mins, and the 2nd is at the Hill Inn in Chapel le Dale at 3 hrs 30 mins. The going was quite fast descending Pen-Y-Ghent as a lot of new paths have been made to prevent erosion. Flint chippings have been used and they are quite nice to run on as there’s that bit of bounce – unlike the older flagstone paths and steps elsewhere in the race. 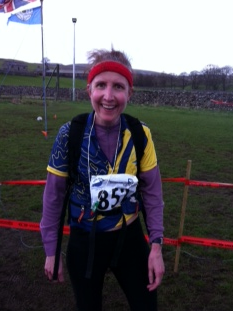 I got to the Ribblehead checkpoint in 2 hrs 26 seconds and was cheered on by my brother. We had deposited 2 drinks at the Start and I collected one of them here as I’d decided not to carry any water with me – something of a mistake as this race is notorious for cramp!. The next hill, Whernside (736m) was extremely steep as we went up the front rather than the ridge. People were using their hands in places! I got severe cramp in my right calf and had to stop while it subsided. I carried on, scoffing a bar to try and replace electrolytes and it helped a bit. One of the marshals had a really booming voice and he kept telling us it wasn’t far to the top. 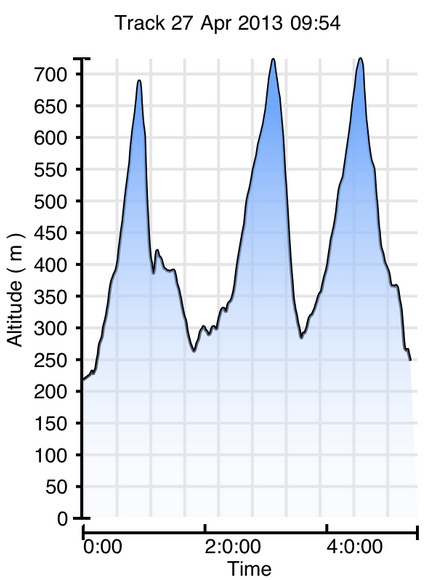 It took me 59 mins to get up Whernside (central peak on graph!) and I knew I’d have to leg it to be inside the cut-off at the Hill Inn. I filled my water bottle from a semi-stagnant puddle and had a welcome drink. Walkers and marshals were very encouraging but kept telling us to hurry up to make the cut-off. My brother met me on his bike about 200m before the checkpoint so that was a good boost and although my time there was 3 hrs 30 mins and 44 seconds, they kept it open for another minute or so before asking people to retire. I later overheard one runner telling another that last year he’d come back on the ‘bus of shame’! The last section was only 11km so even though I was tired, I knew I could do it. John told me that Dave was 10 minutes ahead of me so I was pleased that his knee had held out. I collected my 2nd water bottle and swigged the contents before the final haul up Ingleborogh (724m), which took 55 mins. It was a long but nice descent through the limestone plateaux but finally I saw the marquee in Horton and squeezed out an extra sprint, finishing 616th in a time of 5 hrs 16 mins. Dave and John were waiting for me at the finish line and I must have looked tired as I had to fend off the attentions of an aged St John Ambulance volunteer! 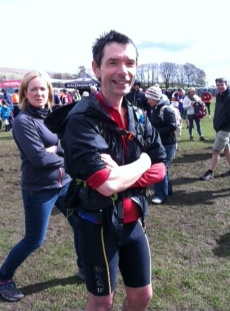 Dave had finished in 5 hrs 2 mins which is pretty good after 7 weeks of no training and we are now looking forward to the White Peak Marathon in 3 weeks! A good read, thanks. Was looking into running the Three Peaks independently as a personal challenge and stumbled on this while looking at routes, transport logistics and estimated times etc. Very useful.